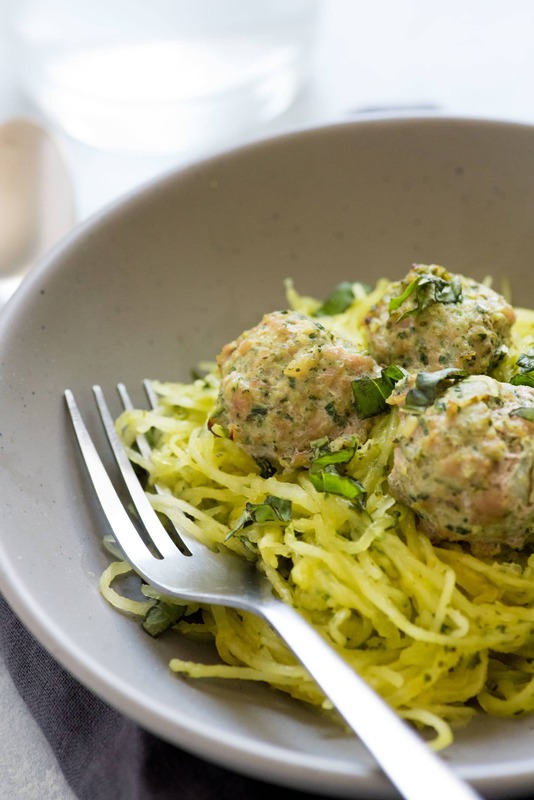 These Turkey Florentine Meatballs with Pesto Spaghetti Squash are grain-free, dairy-free, and nut-free (yes, even the pesto), but they are definitely not flavor-free! You’ll love the combination of the creamy, silky spaghetti squash noodles with the hearty, garlicky meatballs. When I was first told that I had to go grain-free, it’s not an understatement to say that I was devastated. In fact, it took me a few weeks to get over my denial and actually try living without grains. And it took me a few more months before I started to realize that a grain-free diet can be just as satisfying, comforting, and nourishing as a grain-loaded diet. I guess when I heard “grain-free,” I envisioned that my life would henceforth and forever be filled with only salads and smoothies. But when I started to explore the world of grain-free cooking, I was pleasantly surprised at the breadth of hearty, filling, stick-to-your-ribs kind of meals available. I’ve been happy to say that except for a few notable exceptions (I’m talking about you, pizza and buttermilk biscuits), I haven’t missed grains in my life at all. 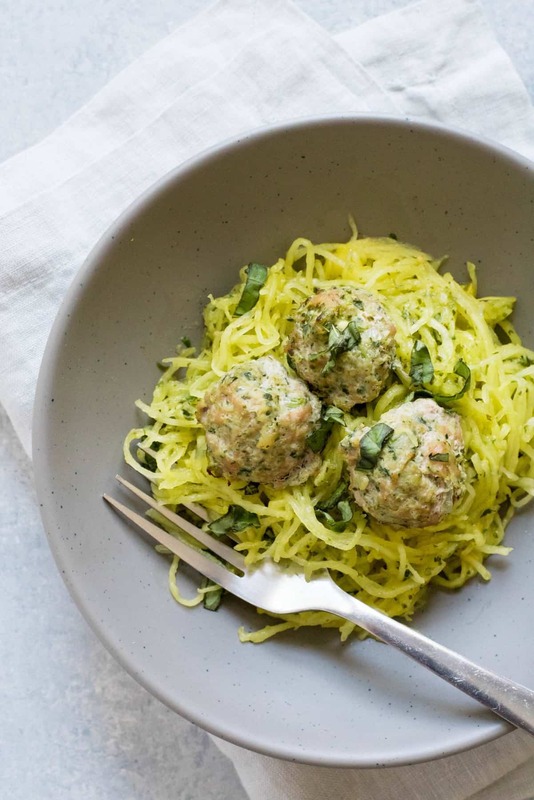 This dish—Turkey Florentine Meatballs with Pesto Spaghetti Squash—is a big reason why the transition was a simple one. This is one of the first recipes I made during my early grain-free days (inspired by this recipe from Dr. Amy Myers), and it’s been in constant rotation ever since. Everyone in the family loves it, and I love that it makes enough leftovers for me to have it for lunch the next day! This recipe is grain-free, dairy-free, and nut-free (yes, even the pesto), and it’s packed full of so much flavor and texture! 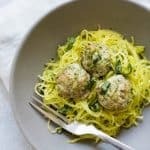 I just love the combination of the creamy, silky spaghetti squash noodles with the hearty, garlicky meatballs. Now, if you’ve ever cooked spaghetti squash before and thought meh, well, I hear you. I used to feel that way about spaghetti squash, too. It was always a mushy, watery, terrible substitute for real pasta. But then I discovered my friend Beth’s tutorial for how to properly cook a spaghetti squash for the longest, most pasta-like noodles, and I haven’t looked back. 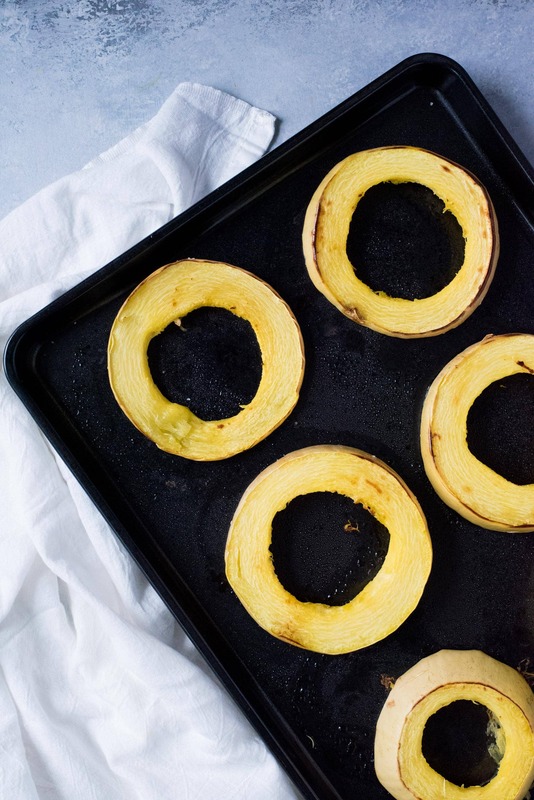 Head over to her blog for the full run through, but the basics: cut the squash into crosswise rings to get the longest noodles, salt liberally and let rest to draw out excess water, and then BAKE the squash (no Instant Pot here—unless you want Mush City). For a grain-free alternative to spaghetti, I prefer properly cooked spaghetti squash over zucchini noodles every time! 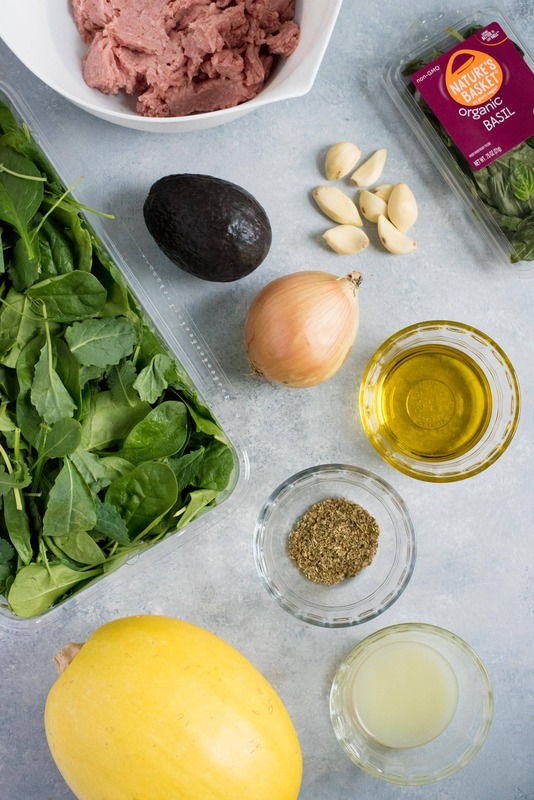 While the spaghetti squash tricks might change your life (they did mine), my favorite part of this recipe is the dairy-free, nut-free baby greens pesto. It’s pretty much the healthiest, most nutrient-dense pesto you could slather on your dinner. It’s packed with cups and cups of kale, spinach, and fresh basil. It’s made creamy and smooth thanks to the healthy fats in avocado and olive oil. And it’s flavored with tons of garlic and fresh lemon juice. It ends up making just the perfect sauce for spaghetti squash noodles (or any kind of noodles). If you aren’t dairy-free and nut-free, you could add in a handful of fresh grated Parmesan and pine nuts to set the flavor over the edge (although really, it doesn’t need it). Of course, you don’t have to make this dish grain-free. It’d be perfectly delicious with a nice bed of piping hot wheat or other grain pasta (or my kid’s favorite, POW! Pasta). 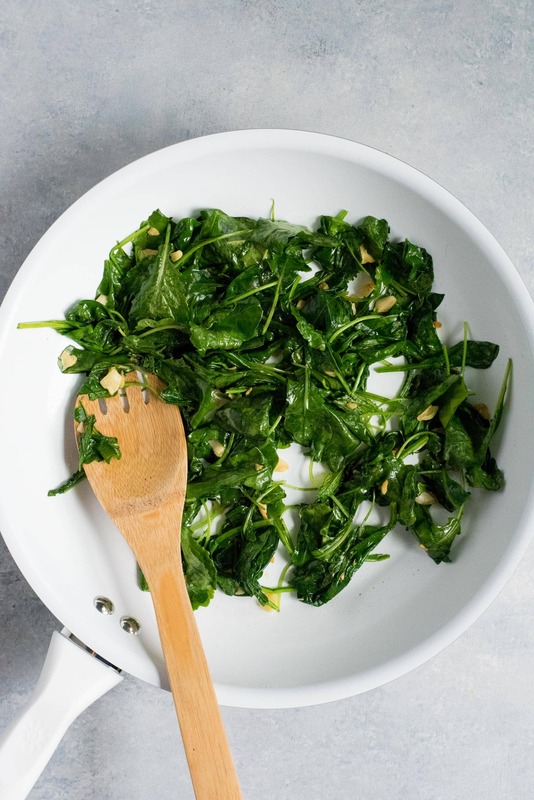 You could also serve it on top of zucchini noodles or mashed cauliflower, or even use the turkey florentine meatballs on top of a salad and use the pesto as a dressing! The elements of the recipe can serve you well all over your kitchen. Enjoy! Preheat oven to 400°. Spray two baking sheets with cooking spray and set aside. Cut 1/2” off each end of the spaghetti squash, then slice the spaghetti squash in half crosswise, then again to make four thick rings (see my friend Beth’s post for why you should do this to get the best spaghetti squash noodles). Remove the seeds and other inside goo. Then place the rings onto a clean kitchen towel. Salt the rings liberally with coarse sea salt. Let rest for 15 minutes while the moisture is drawn out. Using a clean kitchen towel, pat the squash dry, and brush off any extra salt. Place rings on one of the prepared baking sheets. Roast in preheated oven for 25-30 minutes, or until the squash is very tender. Remove from oven and let cool to the touch, then remove the noodles from the squash peel and “fluff” with a fork. Cover with foil or a kitchen towel to keep warm, and set aside. While squash is roasting, heat the coconut or avocado oil in a large skillet. Add in the garlic, and cook until just fragrant, about 3 minutes. Add in the baby spinach and baby kale, tossing to coat with the garlic. Cook until just wilted, about 3 minutes. Remove from heat. 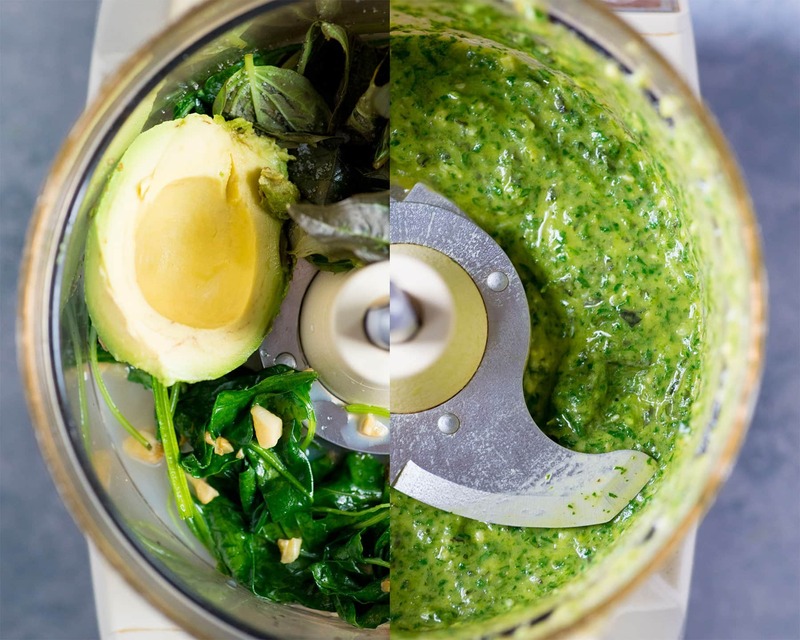 In a food processor, add half of the spinach and kale mixture (reserving half), the basil, lemon juice, 1/2 teaspoon of salt, and avocado. Pulse until well blended and no large chunks of greens remain. You may need to stop and scrape the sides of the food processor a few times. While the food processor is running on low, stream in the olive oil slowly until completely combined. Scoop out the pesto and store in the fridge until ready to serve. Place the food processor bowl back on (no need to clean it), and add the remaining spinach and kale mixture, the onion, the oregano, and 1/2 teaspoon salt. Pulse until everything is well-combined. In a medium bowl, add the spinach and kale mixture from the food processor to the ground turkey. Stir until well-combined. Form mixture into 1 1/2” meatballs (you should get about 24 of ‘em) and place them on a baking sheet. Place in preheated oven, and bake for 12-15 minutes, flipping halfway through cooking time. Meatballs should register 160°F on a thermometer when finished. 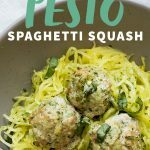 To serve: Toss the hot spaghetti squash noodles with the pesto sauce, and then top with meatballs. If you need to thin the pesto sauce, you can add a little bit of hot broth or hot water to it, and then toss in the noodles. I know you are tempted to skip salting the spaghetti squash. I see you. You say, “it can’t matter that much!” It totally does. Salting brings out a ton of moisture, which is the difference between long, beautiful spaghetti squash noodles and mushy goo of squash. SALT IT. If you’re looking to bump up the nutrient-density of the meatballs, you can add one chicken liver to the food processor before pulsing—the garlic and herbs in the meatballs cover any lingering liver-y flavor—even my three-year-old eats these meatballs! Ground turkey can be tricky. The fresh stuff from the meat counter tends to work best for this recipe because it doesn’t have as much water content as the frozen stuff. If you do use frozen, you’ll want to add 2-4 tablespoons of a thickening flour (such as cassava, arrowroot, or coconut) in order to be able to form the meatballs properly. Or, you can just divvy out the meatballs using a 1 1/2 tablespoon cookie scoop—it’s my favorite way to make meatballs anyway! No yucky hands.